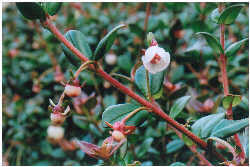 The Chilean guava was very popular in the 1800s in England, but only recently has begun to regain popularity as a fruiting and ornamental plant. In Chile, it is cultivated for its fruits, which are sold locally, but are also exported to Japan. This is a non-invasive plant so can be planted next to patios or windows to enjoy the fragrance. 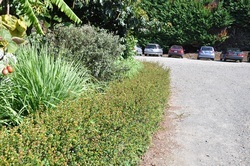 It can be grown as a hedge, in containers, is easily clipped to form a low formal style. An edible substitute for box hedge. Ideal grazing food for children. High in Fibre, Vitamin C and K.
Fruit is very tasty and can be eaten fresh or added to other fruits in desserts. They can also be added to juices, made into jams and jellies. Made into a sauce and added to yoghurt, ice cream or to accompany meat dishes. Yield is very good. You can expect 1 kg of fruit from a 3 year old plant, with yield increasing a kg every year. Grows and fruits well in partial shade or full sun. Tolerant of salty maritime air, and are moderately wind tolerant, though grows better in sheltered sites. They are cold hardy. Ideal for temperate and subtropical climates. Do not let Chilean Guava dry out too much especially when planted in full sun. Best in self fertile, well drained and loamy soil, can grow in sandy soils and clay. So is not fussy. NPK fertiliser applied annually in spring. Mulch to protect roots from drying out. Prune after fruiting to maintain bushy shape. More regularly for box hedge look-alike. Tends to become straggly if left unpruned. Generally pest and disease free. If the plant does get stressed Thrips will be attracted to them. An insecticide from your local garden centre will manage this.